If you plan on moving to a place like River North, you are making a good decision. Home to many young professionals, with hot bars and fancy galleries, attract so many new residents each year. That’s why we at Wolley Movers made sure to offer the best service to all of you out there struggling with moving. If the moving process scares you or you simply don’t have time to handle it yourself (and why does these days?) we are the perfect choice for you. 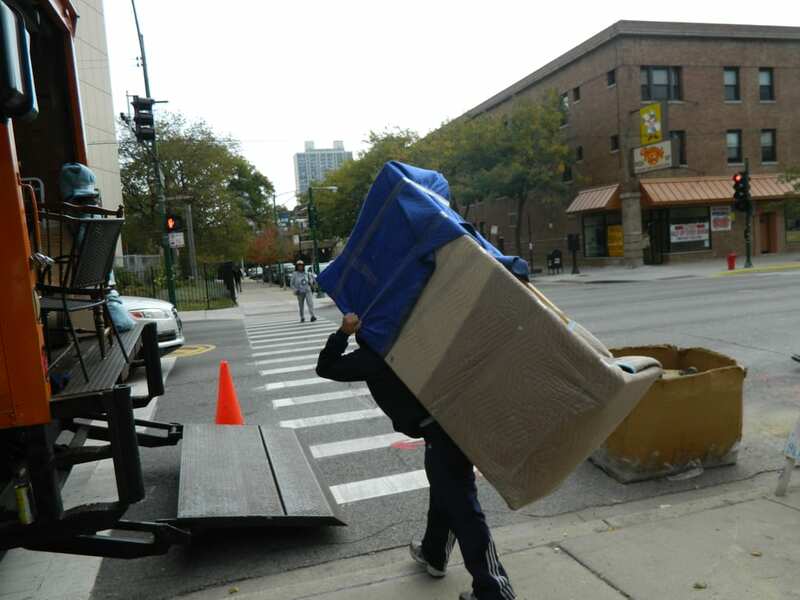 Our professional movers River North Chicago will make your relocation smooth and easy. Why move to River North? If you are a person who enjoys the fast lifestyle that is everything but boring – River North is the neighborhood for you. Here you will enjoy the rich nightlife, many cultural events, bars, restaurants, galleries, etc. And you won’t be alone – many young professionals seek work and fun exactly here. River North is a neighborhood in the Near North Side community area of Chicago, Illinois. As one of Chicago’s most interesting neighborhoods, this area began as an industrial area. Eventually, it moved to become a warehouse district. Later on, the huge but empty buildings were found to be perfect for writers and artists who needed studio and loft space. That was over 30 years ago. Now the area has been transformed into a fashionable cultural hub overflowing with urban professionals, boutiques, antique stores, and of course, it has an incredible amount of art galleries. The area fairly buzzes with excitement, as do the River North movers when they can move people into this ultra-chic neighborhood! The area already has a great number of excellent educational institutions that basically cater to families with children of all ages and interests. The neighborhood is dotted with public schools as well as private academies. During the summer when the little ones are off school, Bessemer Park offers a myriad of arts and crafts programs that will keep your kids and perhaps yourself entertained. And if it gets too hot, Bessemer Park has a spray pool for younger kids and an outdoor pool for adults as well as the older swimmers. As a moving company, Wolley Movers look forward to moving you soon into this incredible neighborhood. Call us or fill out a free estimate on our website today! Bessemer Park is also home to the Bessemer Park Nature and Wildlife Garden, which is a beautiful natural preserve of native fauna and also acts as a wildlife habitat. There are many other new green spaces planned throughout the community. The area also features several designated bike paths. More and more lakefront parks are being created, as well as developing land that will entail mixed residential properties, lakefront recreation, as well as some retail spaces. Why choose us as your movers River North Chicago? As the company with the highest level of professional moving service and long experience, we offer you help with the relocation at reasonable prices. Moving can be stressful and overwhelming, so to avoid that, you can simply hire us to handle it professionally. Our immense experience with moving around Chicago is the answer to all your moving questions. We maintain high-level relocation services and all of that at reasonable prices – what more could you want from movers River North Chicago? River North is one of the most stylish neighborhoods in Chicago and is located very close to the Loop – just across the bridge, and also just a few blocks away from Lake Michigan. It is a perfect place for all of you who are art-lovers since it has many galleries all around. Once warehouses and factories are now transformed into modern offices with many businesses running in the area. However, don’t be tricked by all that daytime culture and work – during nighttime, many bars, clubs, and restaurants become the hot spot of the neighborhood. Whether you are moving from another city or state or moving locally, relocation is hard word work. It needs a lot of planning and organization, and sometimes can be very stressful. If you are somebody who leads a fast-paced life and has no time for that – we have a solution for you. Hiring professional movers River North Chicago is something you need to consider in this situation. We at Wolley Movers offer you the best moving experience. Our knowledge about moving and experience of many years makes us the best in the business. We will adjust our services to your individual needs and give you the best service possible – fast and affordable. Whether you need commercial or residential relocation – we are there for you. However, there are some things you could do before the move. No matter how far away you are moving, planning is necessary. The organization is the key to success and stress-free relocation. Make sure to find an apartment to suit your needs the best. This way you will be able to quickly adjust to the new surroundings and have no problems fitting all your items. Find time to organize your move in accordance with your job – if you need to take some days off, for example. Basically, the earlier you start thinking about the relocation, you will have more time to prepare for a smooth move. We at Wolley Movers have seen a lot of people struggling with so many boxes. Usually, many of these boxes and items are simply no longer necessary, and will only take free space at your new home. From our experience, we can tell you that one step to a simple move is moving fewer items. This means that, before you start packing, be sure to declutter your home. Get rid of the items you no longer use and find them a better home. You can either sell or donate things you don’t want to move to your new home in River North. Furthermore, you will decrease the moving costs and movers River North Chicago will have no troubles relocating your items quick and easy. Our professional movers River North Chicago will do everything they can to help you with the move. However, there is still a lot of work about packing and cleaning both new and old homes. Don’t do everything by yourself – it can be overwhelming. Instead, ask some of your family and friends to help you out. You can make a fun day out of it and invite a couple of them to give you a hand. tape – a lot of it. Each box should be taped several times for safety. cloths, bubble wrap or something similar to protect the breakables. If you are not sure how to do the packing right – there’s no better option for you than taking our packing services Chicago. Our professional team will deal with your items carefully and efficiently, which is the best way to avoid damage. So, if you want your packing to go without any risk and damage, packing services are the right option for you. Our professional movers River North Chicago will provide the best packing services to you. When all the stress about moving goes away, you should be happy and satisfied with your new home. Also, living in River North is a great thing and you should enjoy it! Take some time to explore the area and find your favorite places to relax and have some fun. And in River North – there are many! As one of the various relocation companies in the neighborhood, Wolley Movers looks forward to moving more people into these new developments. Give us the opportunity to become your favorite movers River North Chicago relocating company!